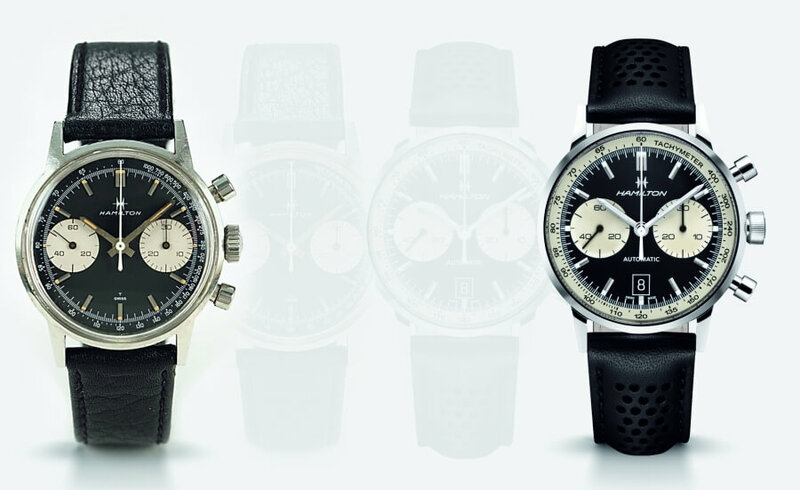 In 1968 Hamilton presented two new timepieces among others, the Chronograph A with black subdials on a white dial, and the Chronograph B with two white subdials lying against a black background, creating a “reverse panda” face. This type of dial design was very popular in the 60s and 70s. Great attention to detail was a key request for the new Intra-Matic 68 Auto Chrono, and many elements have almost remained untouched. The dial in particular stays true to the “reverse” panda face of the timepiece’s origins, and is circled by a white tachymeter scale. 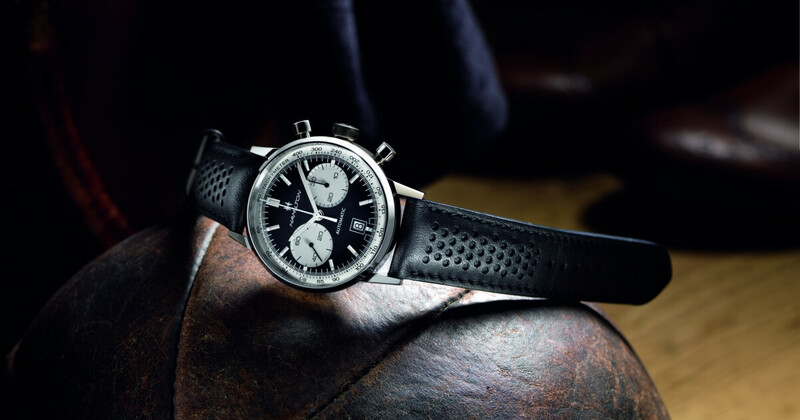 Black and white seems to be the overall theme of the watch, with the date on a dark background, a snowy white central chronograph seconds hand and black lacquered counter hands. Inside the polished stainless steel case is the automatic H-31 movement and its 60-hour power reserve, a technical extension most welcome in today’s busy lives. Additional parts that have been adapted to present taste include a 42mm case, bigger than its predecessor, and Super-LumiNova coating on the hour and minute hands for higher legibility. Hamilton Intra-Matic 68 has a water resistance up to 10 bar (100m). 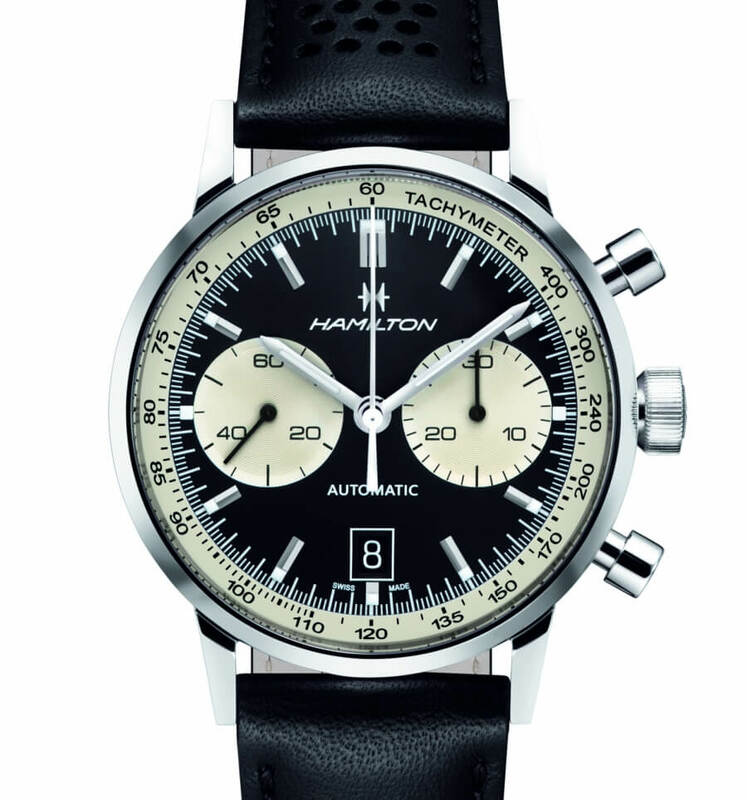 To delight Hamilton aficionados and collectors alike, the Intra-Matic 68 Auto Chrono emulates that of its illustrious inspiration with vintage-feel pushers placed on each side of the crowns and the same solid stainless steel case back. This overall retro character and sense of heritage is further accentuated by a domed-shape dial and curved hands. The black calf leather strap is a cut-edge type, which uses the most traditional strap-production techniques, and is gently perforated for a 60’s-style sporty touch. An ideal companion for individuals of character with a taste for vintage charm and watchmaking heritage, the 1,968-piece limited edition Intra-Matic 68 comes with a special luxury packaging as the ultimate finishing touch.